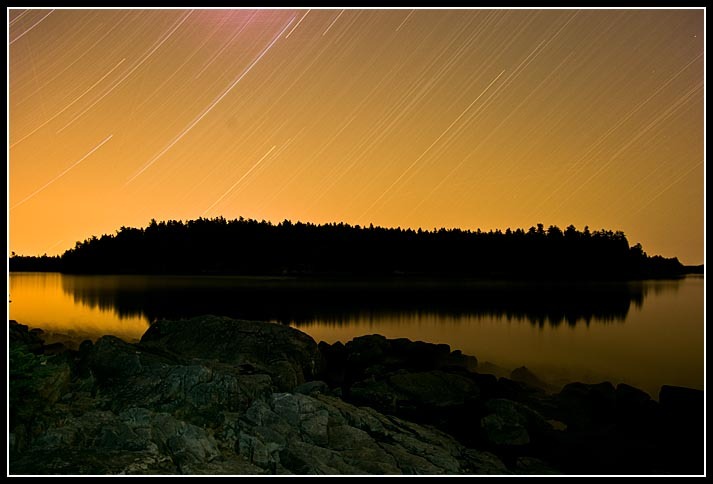 I finally got around to doing another test with my Pentax K10D and 16-45/4 lens as I was camping on the Maine coast. I set up the tripod and started the exposure a couple hours after sunset. The stars were out big and bright, there was no sign of the moon, and it's an isolated area but the sky still seemed to be pretty bright. I locked the shutter open (ISO 100@f/5.6), popped the flash a few times on the foreground rocks, and let the sky do its thing for 1 hour 50 minutes. The battery still held up through the dark frame and I was happy with how the sky came out. Unfortunately for the first time it seems there is some obvious noise coming in, especially in the upper left/center. the purplish glow in the top is amp noise, and it is caused by a component in the camera that heats up and that heats up the sensor. thus the amp noise is created.